Arrow and The Flash get season renewals, and Vixen joins the CW DC Universe! In case you missed it, fans of DC Entertainment and The CW’s list of awesome superhero shows are getting lots wonderful news, as the network has formally announced that they are renewing several of their programs, which includes Arrow and The Flash, and are bringing more things straight out of the DC Universe! Straight from The CW’s Facebook page, both hero shows are renewed for its fourth and second seasons respectively, the shows that feature live-action interpretations of DC Comics’ own Green Arrow and The Flash are among the most critically acclaimed television shows of recent memory. In fact The Flash is a spin-off of Arrow, which just began life with its first season last October and starring Glee actor Grant Gustin in the titular role as Barry Allen/ The Flash. Arrow on the other hand has been a non-stop juggernaut superhero program that has continued to aim for higher things and introduce more elements and characters that will eventually spawn a “DC Television Universe” and inevitably a “Justice League” for the small screen. Stephen Amell continues to dominate as Oliver Queen/ Arrow on TV and the internet for his invaluable PR and charisma in reaching out to his fans. That, combined with stellar writing and direction by showrunners such as Greg Berlanti and Andrew Kreisberg, have kept things interesting and fans hungry for more from “The Bolt and The Bow”. Speaking of the combo, Comic Book.com reports that CW President Mark Pedowitz has stated that after the crossover’s success last fall, the network is looking to make the “Flash and Arrow” crossover an annual thing… And maybe even more if other characters such as Ray Palmer/ Atom and Ronnie Raymond/ Firestorm actually get their own spinoff shows like The Flash. Former Superman actor Brandon Routh now plays the head of Palmer Industries and future size-changing superhero in Arrow, while Stephen Amell’s cousin Robbie Amell plays the other enhanced “Metahuman” and boyfriend to supporting character Caitlin Snow in The Flash. How this is going to go down each year still remains a mystery, but it is an exciting prospect nevertheless. And speaking of actual spinoffs, a brand new series set in the same CW DC Universe is coming later this fall… As KSite TV reports that The CW’s internet based “CW Seed” will be airing a “Vixen” animated series! Starring the alter ego of Mari Jiwe McCabe, who uses the powers of a totem to summon the powers of an animal to fight for justice, this marks the first animated venture set in the same universe as the live-action Arrow and The Flash! Both characters are expected to appear and will most likely be voiced by Stephen Amell and Grant Gustin. As to who will play the beautiful heroine, no details have been given other than two preview pics, including one with the character’s origin explained. How and when it will air is anyone’s guess. 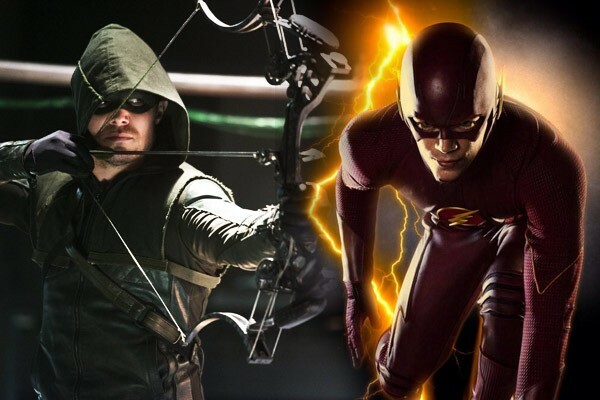 Arrow and The Flash are returning to resume their respective seasons this January on The CW! Next articleMarvel unleashes the second trailer for Avengers: Age of Ultron!